EXPAT journalist David Baird has reported around the world on everything from earthquakes to wine festivals. So, it came as a thrill when two local schools chose one of his books, based on life in southern Spain, as part of the syllabus. High school pupils in Nerja were the first to make his book Sunny Side Up the object of study. Now Motril’s Escuela Oficial de Idiomas has announced it is using the book for fifth grade students and has invited Baird to make a presentation and answer pupils’ questions. 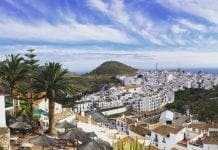 “It is a bit daunting,” says Shropshire-born Baird, who lives in nearby Frigiliana. “Like most journalists, I’m used to asking questions rather than answering them. Sunny Side Up, distributed by Maroma Press, is David’s ironic look at rural life, reflecting the dramatic changes in Andalucia since he settled in Frigiliana more than 30 years ago.